A really clever alternative to fried chicken. Egg white and breadcrumbs give a great coating whilst the garlic, herbs and tomato puree and cayenne give it a kick. 1 Preheat your own to 220°C, Gas 7 and line a baking sheet with non-stick baking parchment. 2 Mix the tomato puree, cayenne pepper, garlic salt and mixed herbs in a large bowl and season with black pepper. Whisk the egg white in a clean glass bowl until stiff peaks form, then fold into the tomato puree mixture. 3 Whizz the torn roll in a food processor until you have fine crumbs, then transfer to a plate. 4 Dip the chicken thighs into the egg mixture then roll in the breadcrumbs to coat evenly. Arrange the pieces in a single layer on the prepared baking sheet. Spray with low calorie cooking spray and bake for 25-30 minutes or until cooked through. 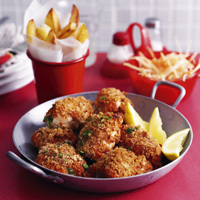 5 Scatter with parsley and serve hot with chips and lemon wedges.